Nobel laureate Edward Prescott got The Phone Call at 4 a.m., an hour typically not a harbinger of good tidings. “I had seen the betting odds and I had thought that if I were to get it, it would be precisely for what they gave the award for,” said Prescott, who shared the 2004 Nobel Prize in Economic Sciences with Finn E. Kydland for their contributions to dynamic macroeconomics: the time consistency of economic policy and the driving forces behind business cycles. Prescott, a Regents' Professor in the W. P. Carey School of Business, won his Nobel while at Arizona State University. “I did not think a Nobel Prize would be a big deal, but it turned out to be,” he said. With the addition this month of two more Nobel winners, the university now claims a quartet of the world’s highest academic honorees. ASU’s Nobel laureates (from left): Edward Prescott, Leland Hartwell, Sidney Altman and Frank Wilczek. Altman and Wilczek recently joined the ASU faculty. Leland Hartwell, Virginia G. Piper Chair of Personalized Medicine and chief scientist of the Center for Sustainable Health in the Biodesign Institute, won the 2001 Nobel Prize in Physiology or Medicine for his discoveries of a specific class of genes that control the cell cycle. Sidney Altman shared the Nobel Prize in Chemistry in 1989 with Thomas R. Cech for their discoveries, independent of each other, that ribonucleic acid actively aids chemical reactions in cells. Altman will join the School of Life Sciences as a professor. Frank Wilczek, a theoretical physicist and mathematician, shared the 2004 Nobel Prize in Physics with David Gross and H. David Politzer for their discovery of asymptotic freedom in the theory of the strong interaction. Wilczek will join the Department of Physics. Nobel laureates can go anywhere they want, but they chose ASU. Lawrence Krauss, theoretical physicist and cosmologist, was instrumental in bringing the two newest laureates here. He explained the benefit to a university of having them on campus. 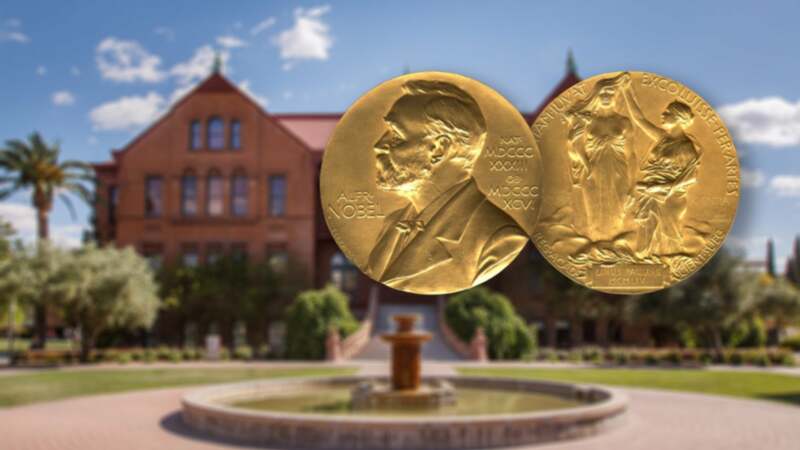 “Having Nobel laureates on the faculty demonstrates that ASU is a major research institution, but more than that, it offers an environment for research and education that cannot be found at traditional famous institutions like MIT and Yale,” Krauss said. Prescott has often said he enjoys challenges, and he said he has found them in the classroom at ASU. Krauss said students having the access to learn from Nobel laureates is an enormous benefit. “While of course prizes are arbitrary to some extent, these individuals have made major contributions to human knowledge, and it is important that our students know that they can have direct access to minds like theirs, and other great faculty at the university, as they continue their studies here,” he said. Prescott said he has found a culture of collaboration at ASU. He has also been challenged intellectually. When someone takes time to criticize your work, that’s a compliment,” he said. Exposing internationally recognized scientists to ASU faculty and students and the university’s transdisciplinary culture via the Origins project was the first step in inviting them to join the faculty, Krauss said.